Below (finally!) 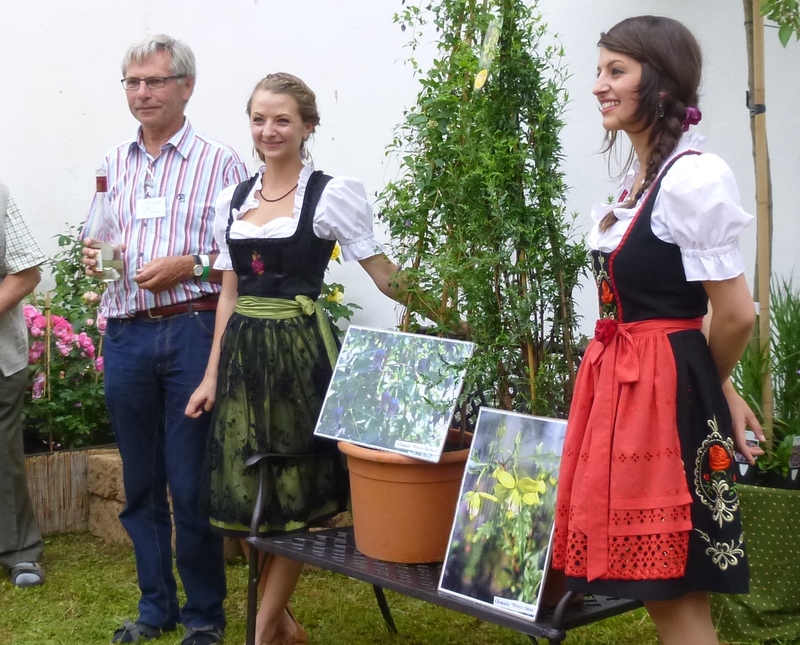 is Part 3 of my impressions of the International Clematis Conference in Southern Germany in late June and early July of 2013. 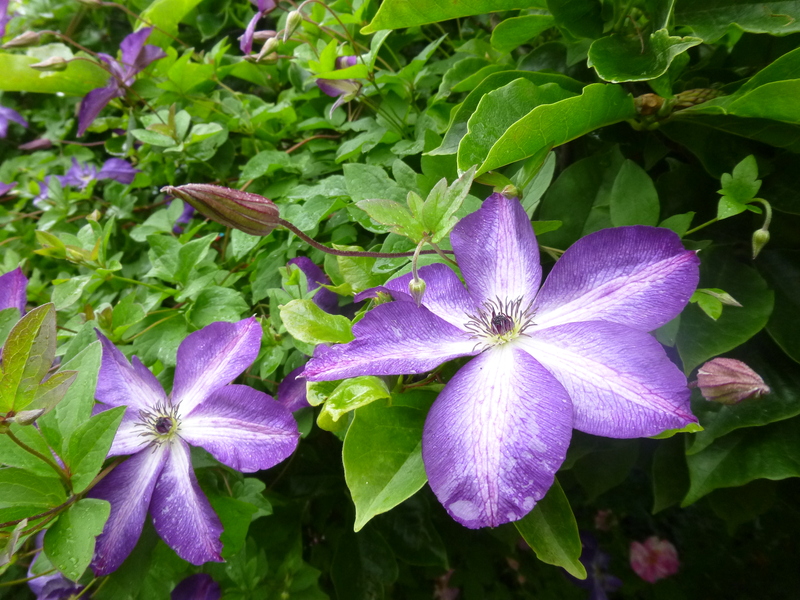 If you would like to read Parts 1 and 2, please go to Categories on the left, click on International Clematis Conference 2013. 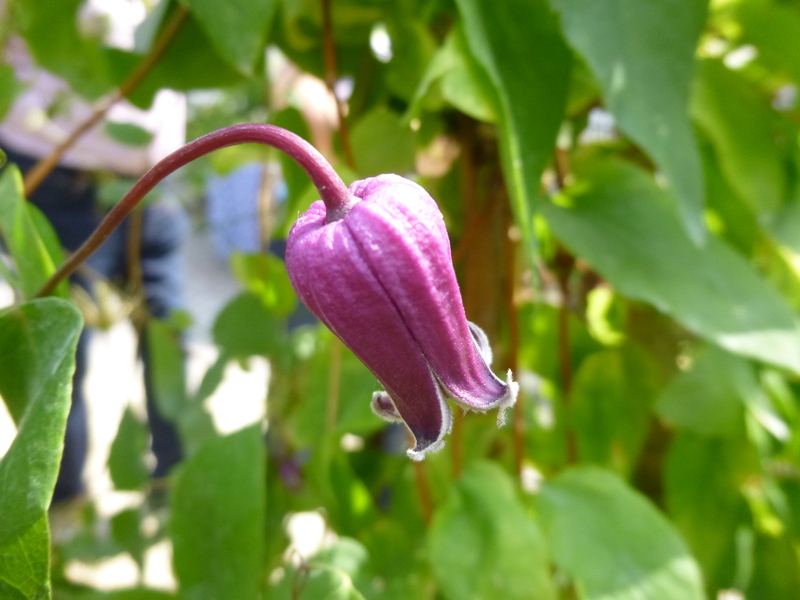 After visiting Ludwigsburg near Stuttgart, the International Clematis Society group headed in the direction of Neu-Ulm, but made a few stops along the way. 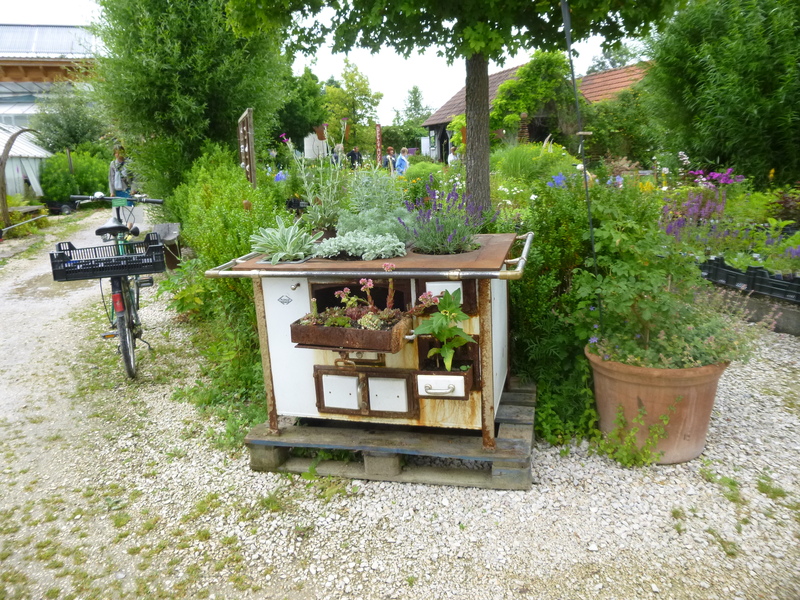 First up was the Haus der Guten Dinge (House of Good Things), an entrancing shop offering a countless variety of wonderful garden accessories, from pots to statuary to garden furniture. We wondered through several courtyards and indoor spaces all artfully arranged with loads of Dinge! I found a small pottery bird I liked, which I managed to get home safely. 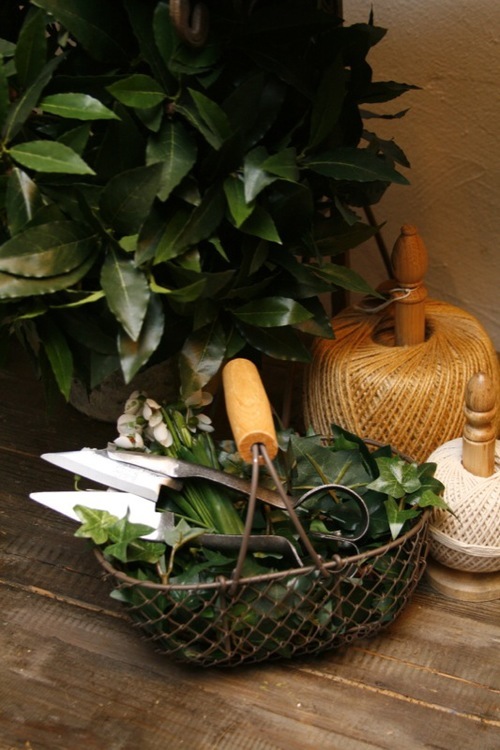 The pair of special topiary shears (resting in the wire basket in this photo) that I planned to use on my one little squirrel topiary did not fair so well. I foolishly forgot to move them from my carry on to my checked luggage, and they were confiscated by airport personnel in Amsterdam. Oh, so sad. I hope I will never make that mistake again! 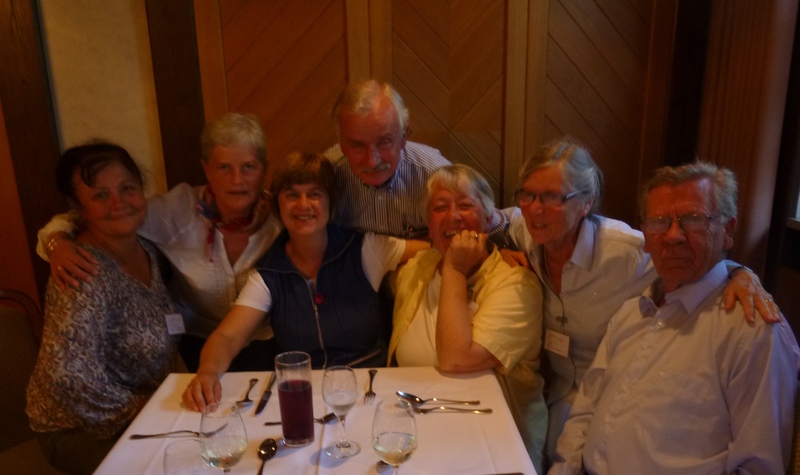 The group went on the Arboretum at the University of Hohenheim where we listened to a talk on special organic fertilizers, after which our bus driver treated us to a traditional lunch of sausage sandwiches that he prepared himself. The more energetic among us also took a guided tour of the historic arboretum maintained at the University of Hohenheim. This arboretum is especially known for large and beautiful specimens of American trees that are over 200 years old, including oak, buckeye, and tulip trees. Our afternoon stop was the pièce de résistance of the day — actually, one of the major highlights of the entire trip! 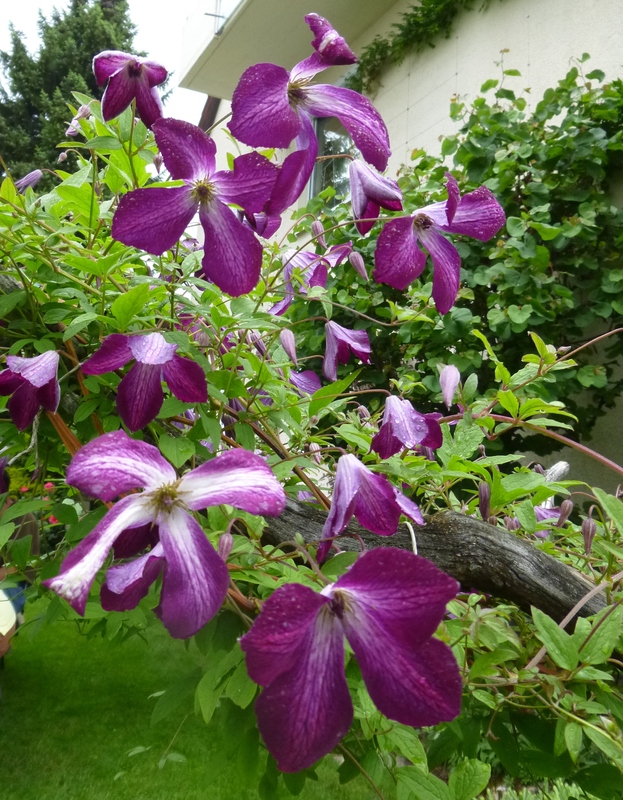 Gisela and Walter are long-time members of the International Clematis Society and have attended many of the society’s international conferences, always buying clematis along the way. 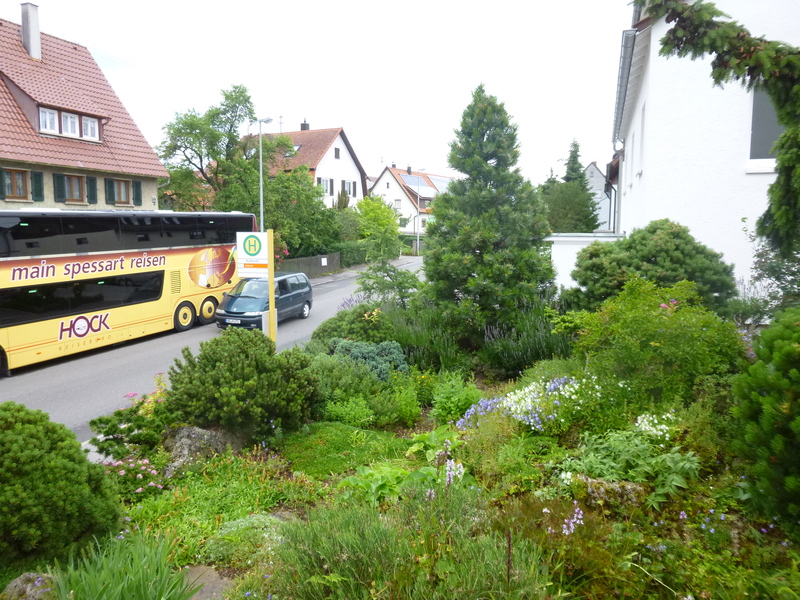 Immediately upon arriving in front of their home in the bus, we all knew that this would be a fabulous garden. 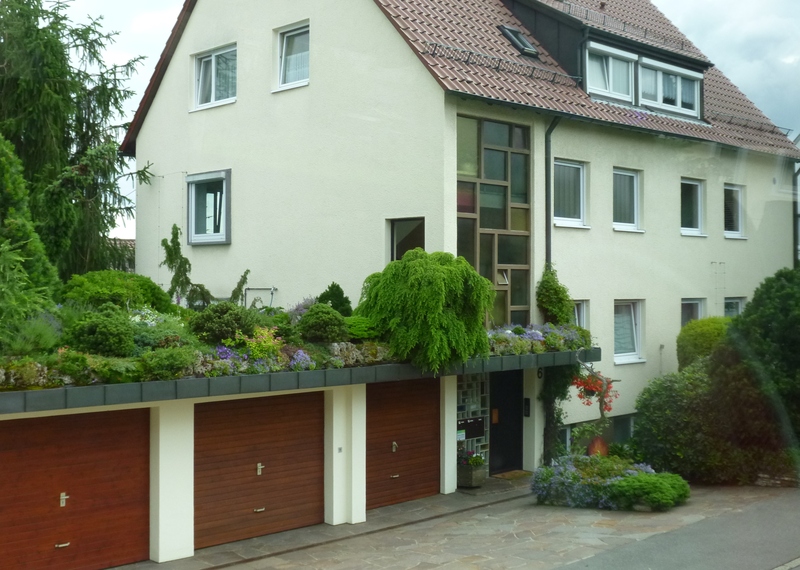 Just take a gander at the roof-top garden over the garages — it even has a small pond! 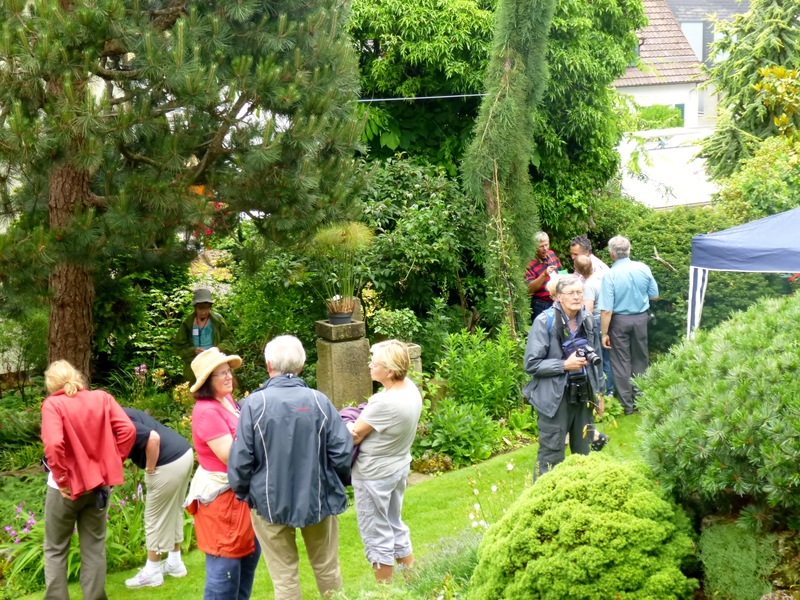 After walking through the gardens along the side of the house, we entered the back garden where we were astounded. Loads of clematis throughout the garden were gracing many unusual specimen plants, as well as arbors, trellises, pergolas, and pillars. Everywhere one looked was another surprise. One of the biggest surprises was that they had purchased a second lot in the back and filled that one, too. Gisela and Walter traveled with our group for the first few days of the trip, but then had to leave to return home to prepare for our visit. When we arrived, we were treated not only to a lovely garden, but also to coffee and tea, accompanied by huge and delicious cakes slathered with glistening fruit. 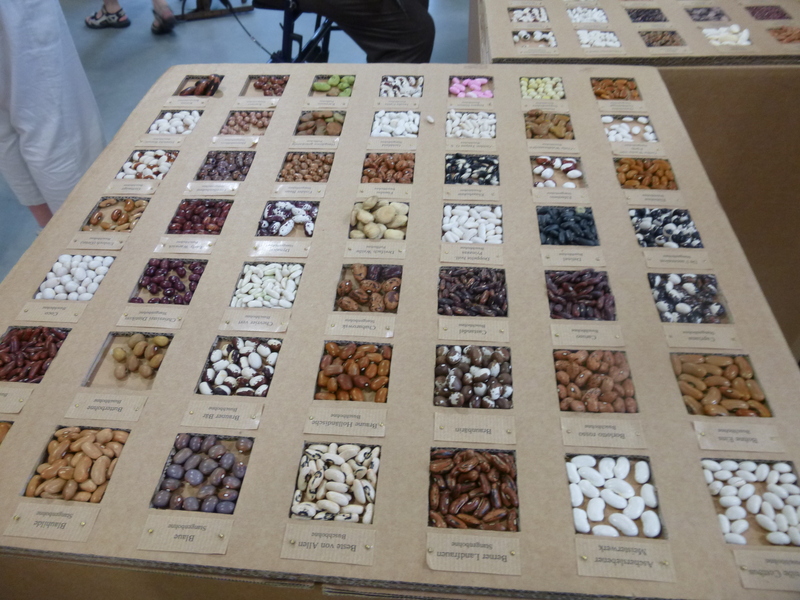 I was too busy sampling the wares to remember to take photos of them. We all wanted to stay forever. The one downside of the afternoon occurred when our revered new president, fellow Pacific Northwesterner Linda Beutler somehow managed to coerce me to singing America the Beautiful with her in celebration of the Fourth of July — even though I can’t sing a lick. Geesh, embarrassing. 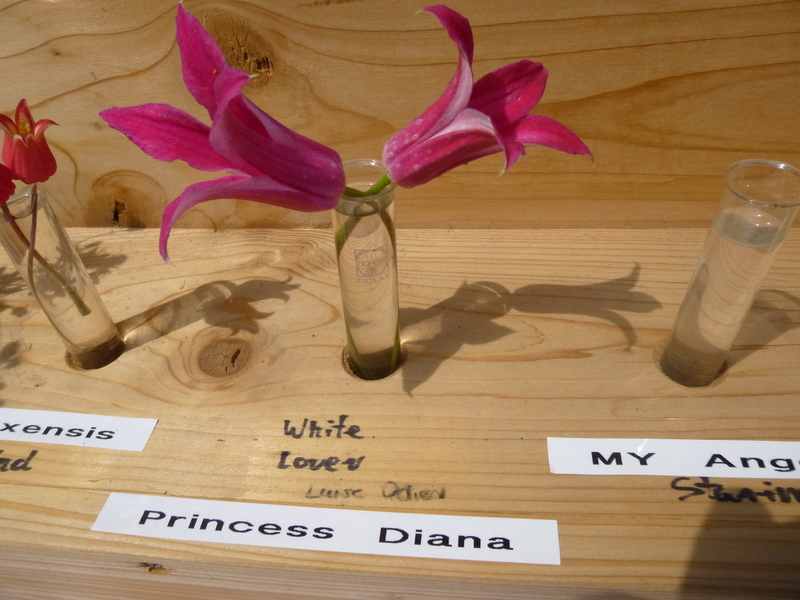 Enjoy the photos below of the beautiful and well-loved Stabler garden. What a Pergola and Patio Combination! 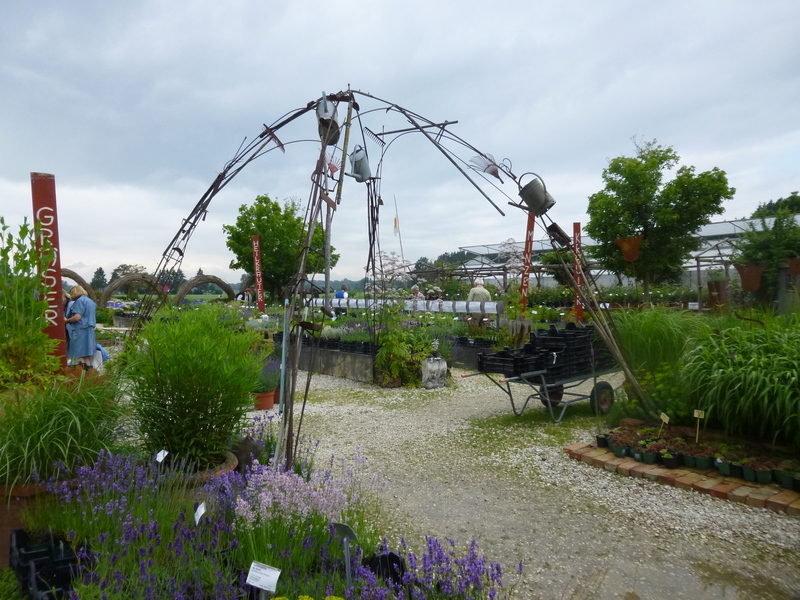 We kicked off the next day with a visit to the very interesting Perennial Nursery and Display Garden of Dieter Gaissmayer. Adjacent to the display and sales areas is the Garden Museum. Interesting antique gardening memorabilia were on show there, including old seed advertisements, antique bell jars, old tools, and a plethora of heirloom bean seeds. 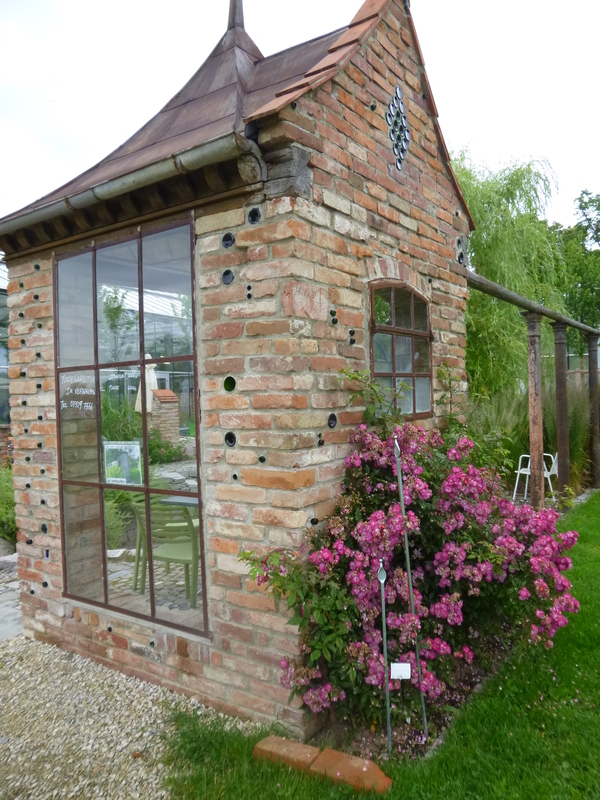 Small historic outbuilding, restored and placed on the grounds. 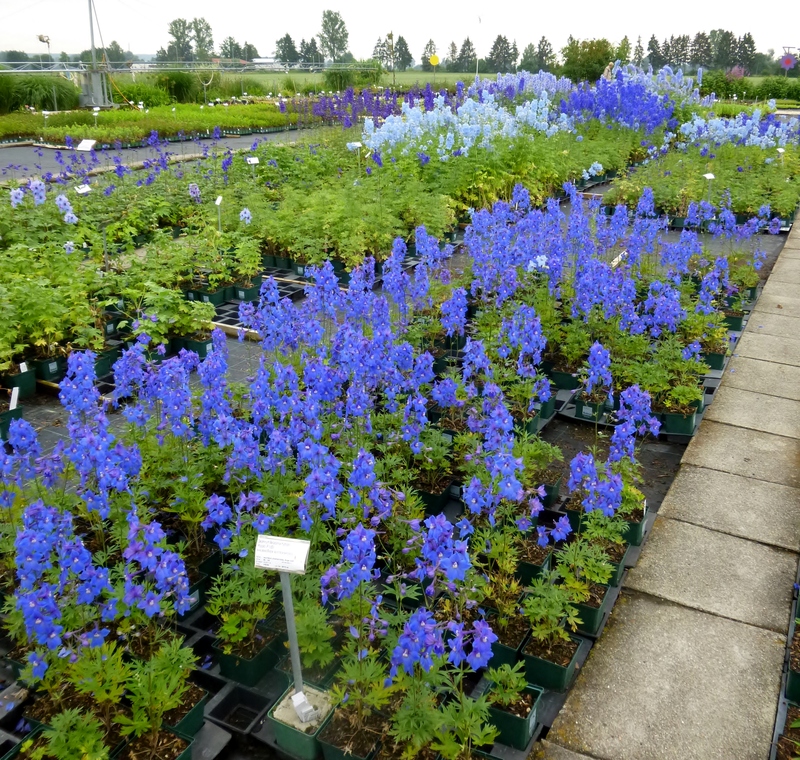 Sales Area — check out those delphiniums! 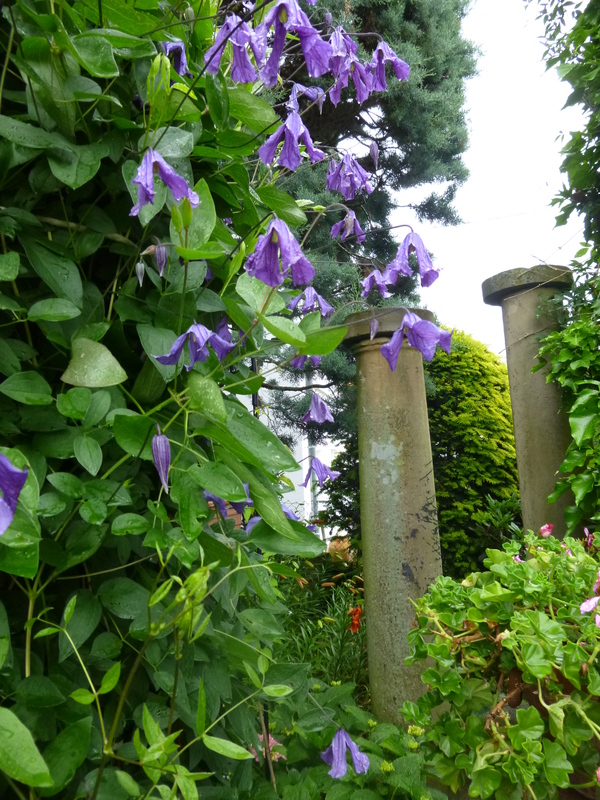 Below are a couple of quirky and inspiring structures with great potential for clematis! Oh, can’t you just envision eight or ten clematis cascading off of this one? 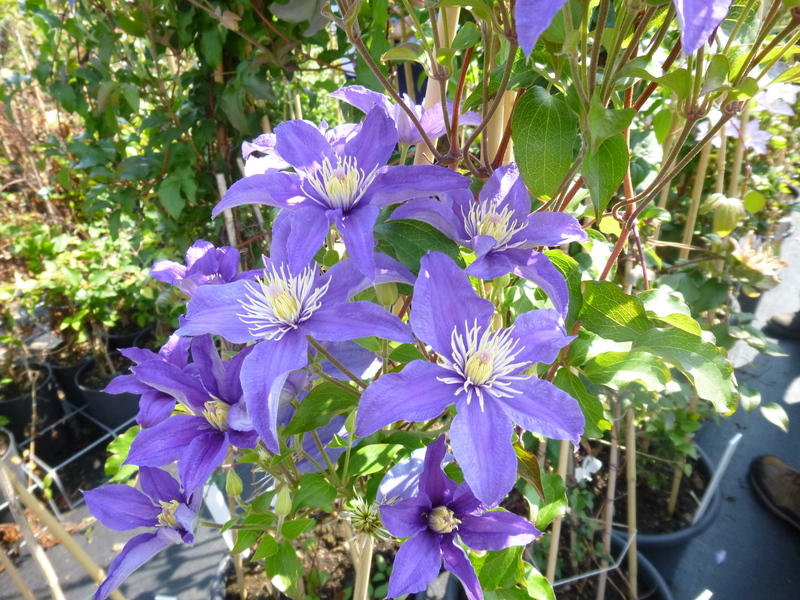 A good one for short clematis maybe? The two gardens we were originally scheduled to visit in the afternoon had been flooded in bad rains southern Germany experienced earlier in the spring. 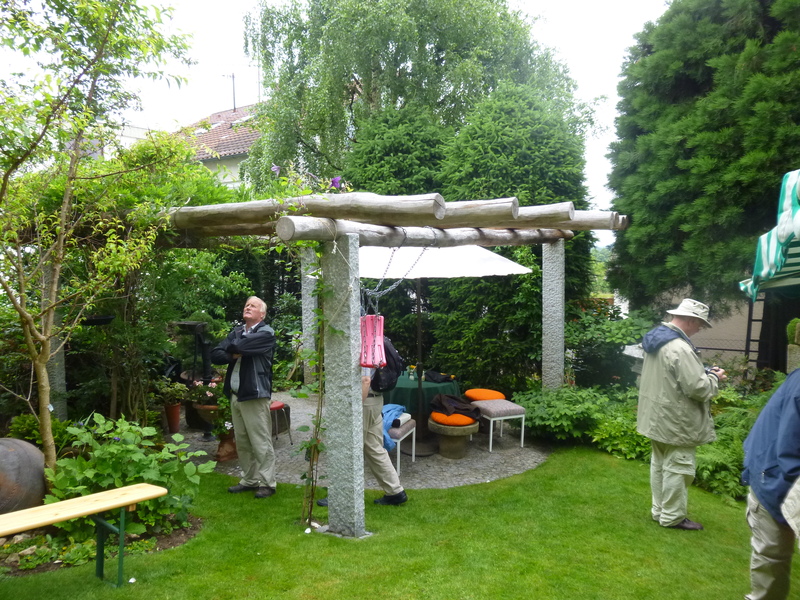 Instead, we visited two charming southern Bavarian gardens in the foothills of the Alps. 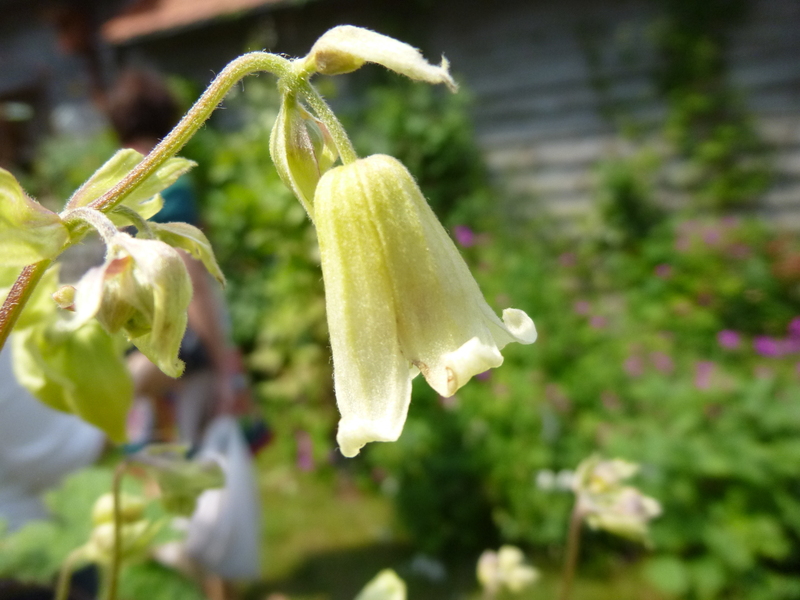 Both gardens had clematis on show. 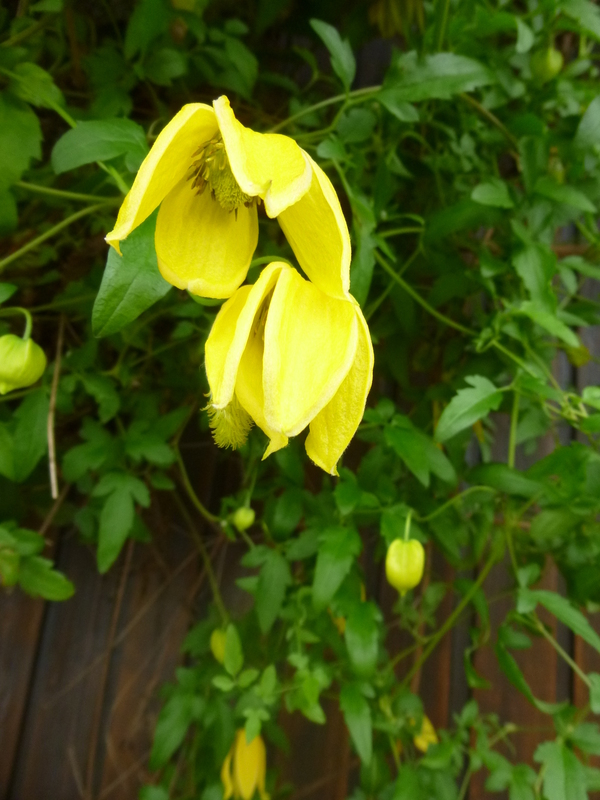 Large Clematis tanguitica draped over the deck and wall. On our way back to our hotel in the late afternoon, we stopped in the city of Ulm for a short visit. Some of us stopped for ice cream and did a little bit of shopping. I got a pair of cool green sunglasses. 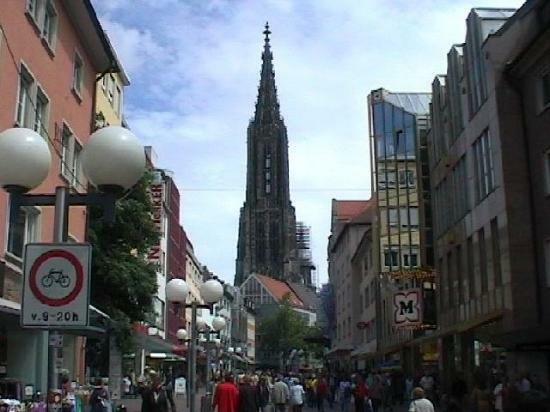 Others visited the large gothic church, called the Ulm Minster. 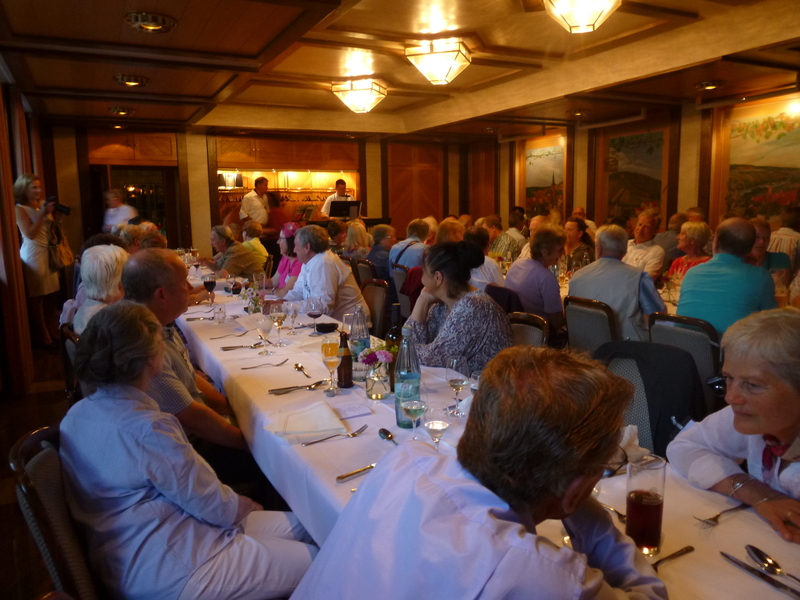 Then back to the hotel in Neu-Ulm for dinner and REST! On the final full day of the conference, we all packed up and loaded the bus with our things again. 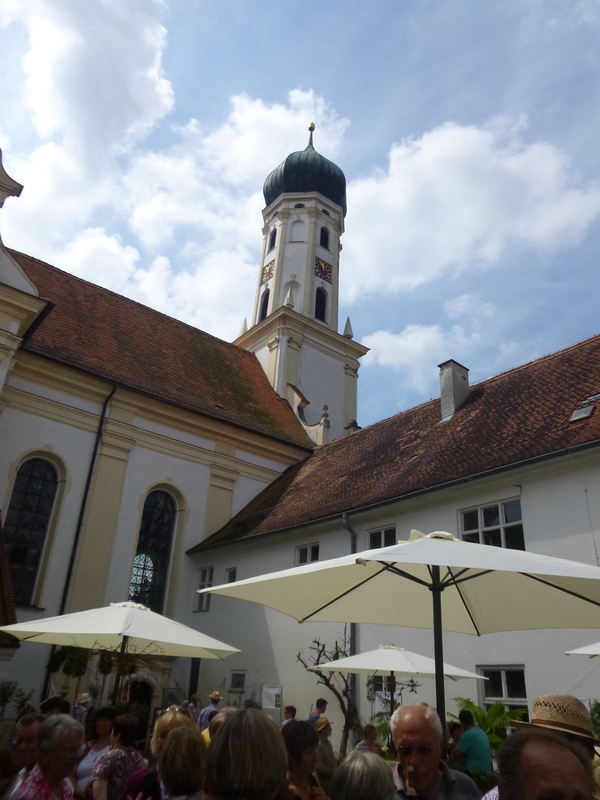 On schedule for the day was a visit to the small village of Unterleitzheim to attend the renowned Rose and Clematis Festival, which happens only every three years and draws loads of visitors from near and far (including us!). The festival was packed with people and flowers! We all went off in different directions, running into each other again here and there. We wandered around drinking in all the beautiful clematis and roses in bloom. 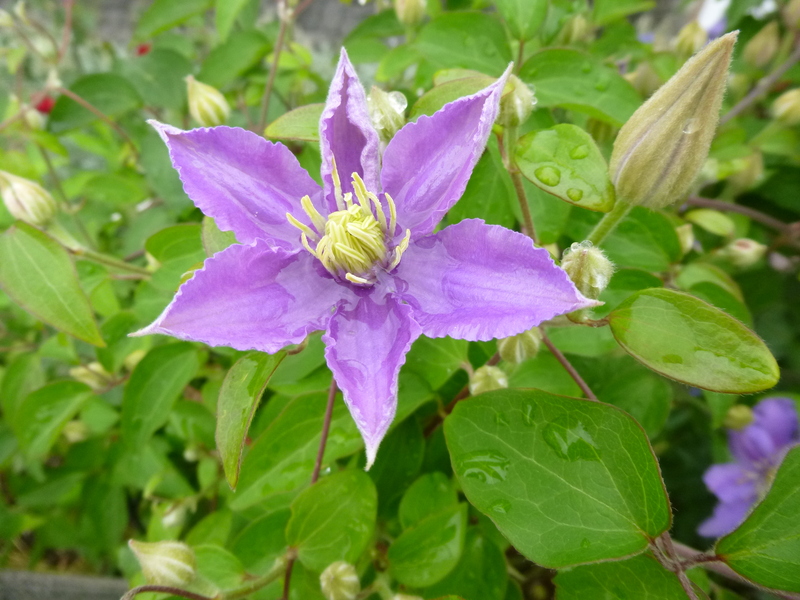 Many of my European friends purchased luscious clematis plants that were available from the many vendors — not so for me, alas. I had no permit to import plants. 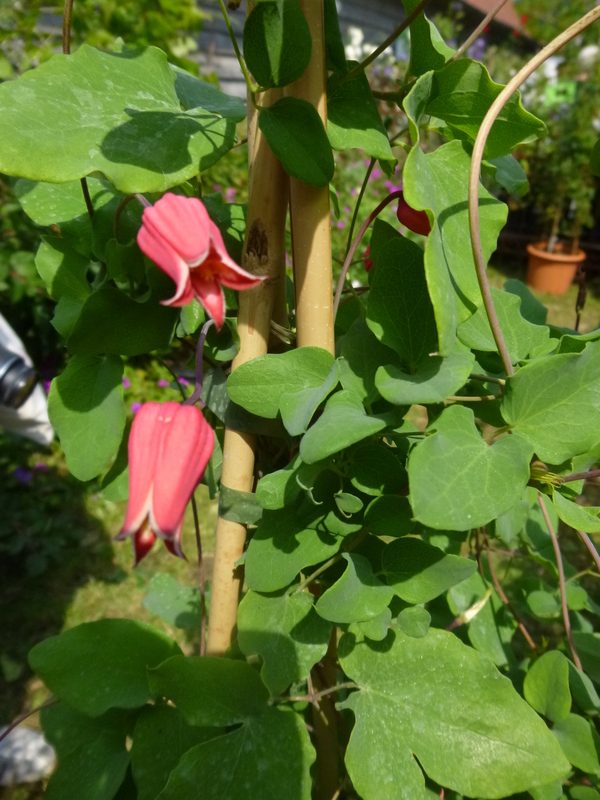 To soothe my unrequited clematis lust, I bought a handcrafted necklace and a pair earrings. Lunch was available at the Festival — I enjoyed a relaxing outdoor meal and some leisurely people watching. See below just a few of the lovely clematis at the Festival. Also at the festival, our own Ton Hannink (president at the time of the International Clematis Society) presented two new clematis named for the daughters of the hybridizer. 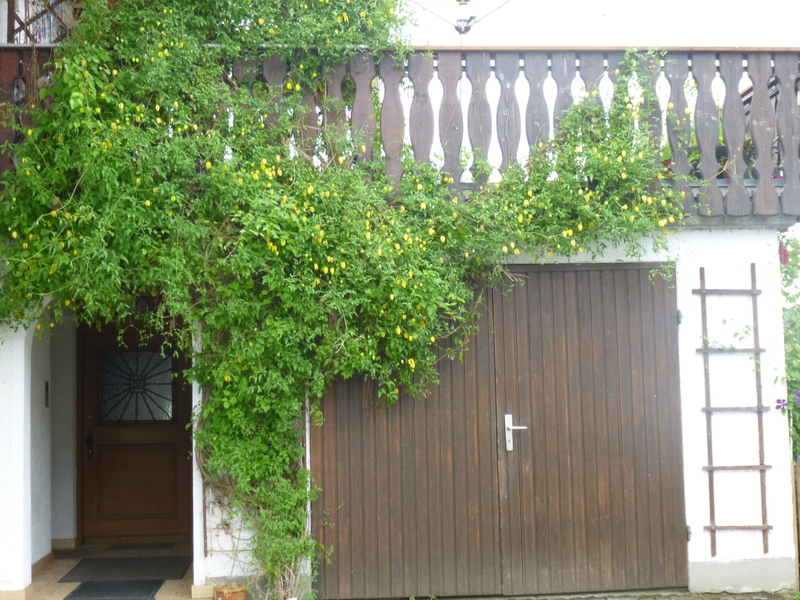 You can see them both below (the daughters and the clematis), with Ton on the left. 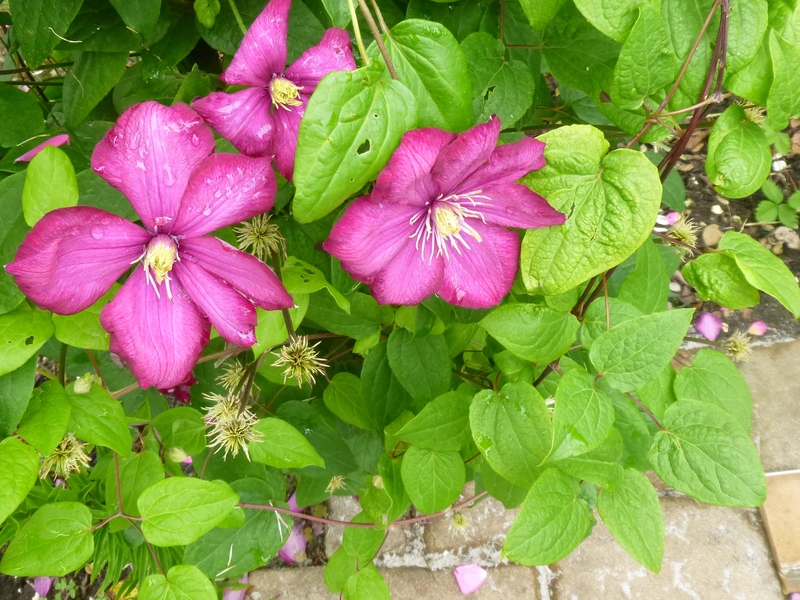 Two clematis named for the two daughters of the hybridizer! 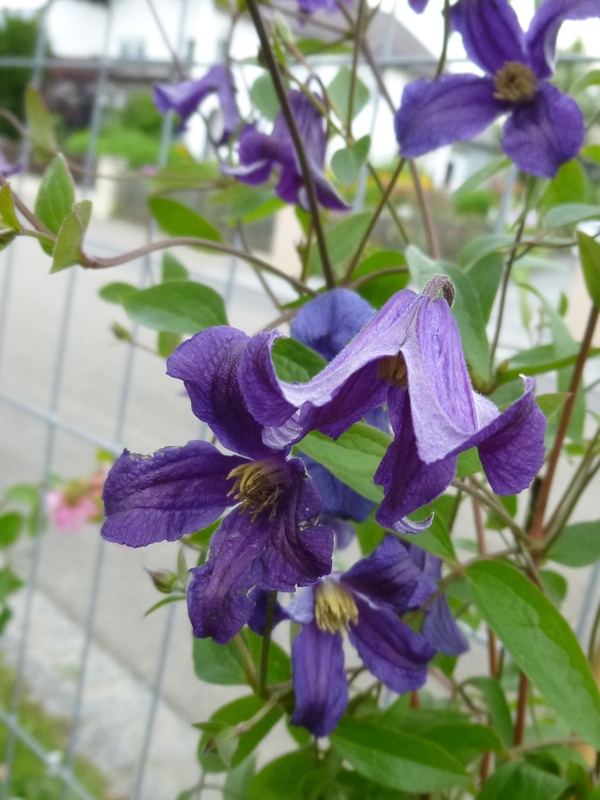 In the afternoon, we left Unterleitzheim for a long drive back to where the conference had begun a week earlier in Erlabrunn, the Village with Clematis Fever. 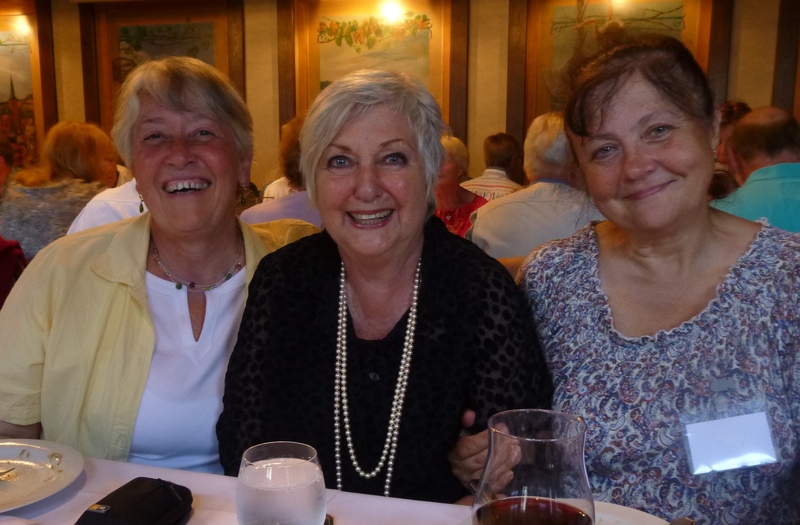 Here on the last night of the conference we enjoyed a gala dinner and began all the long goodbyes to our clematis friends. During the dinner Klaus Korber (a former President of the society and one of the organizers of the trip) performed jazz music for us again. 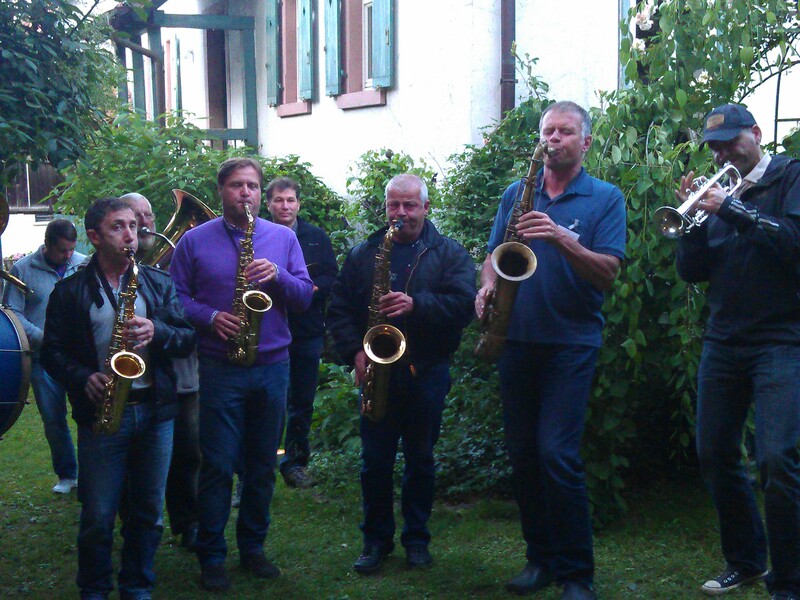 The week before he and his long-time friends in the village, who have played together for many years, had serenaded us in his garden — see photo below. The following morning after breakfast we all went our separate ways. 2014 International Clematis Conference in June in Philadelphia!